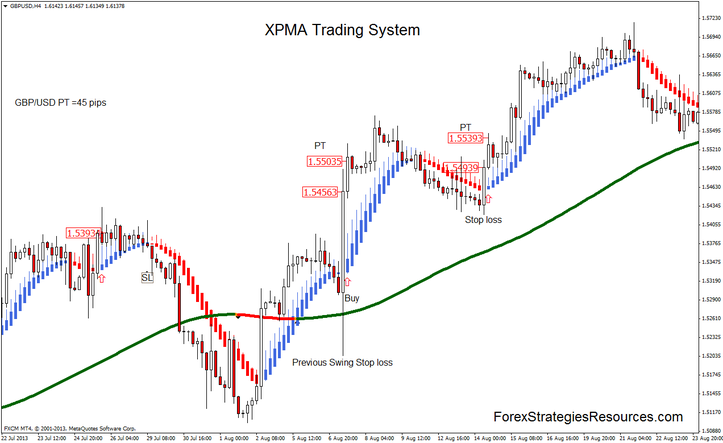 XpMa Trading system is a trend folllowing Trading System and it's based on XPMA indicator. Wait the Heiken Ashi Smoothed turn green color. Wait the Heiken Ashi Smoothed turn red color. Profit Target predetermined that depends by time frame and Currency pair. Profit Target ratio 1.3 stop loss. EUR /USD: 40 pips,;GBP/USD:45 pips, GBPJPY:50 pips, AUD/USD/40 pips, USD/CHF 35 pips, EUR/JPY 45 pips, USD/JPY: 35 pips. In the picture below XPMA Trading system in action.